Carver ’s 32 Mariner boasts a large cockpit with a wide transom door, leading to full size glass sliding doors with screens into a very spacious, one-level cabin. The widest walk-around available provides easy access to forward decks for locking and docking. A huge flybridge accessed from both port and starboard sides gives the Mariner all the advantages of a bridge boat, but her low profile makes her much easier to handle in a stiff breeze. There is ample seating up top for several passengers, a convenient table and plenty of storage. 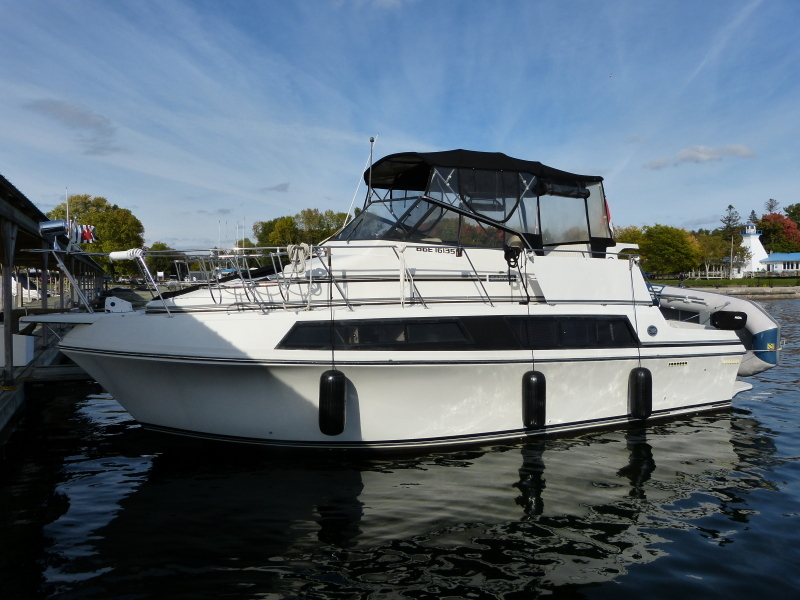 This professionally maintained, freshwater 32 Mariner is fully equipped with a generator, heating and air conditioning, an all chain windlass and a dinghy with motor. She has had extensive upgrades including new stringers and bulkheads, new vacu-flush head and holding tank, new hot water heater and new V-drives, and is in great condition overall.